As you know I’m a sucker for a well written burning hot vampire. My perfect vampire hero would be a bad boy who takes the heroine right to the edge. And guys, do I have a doozy for you. Meet Kane Malloy and boy is he bad to the bone. Woo Hoo! 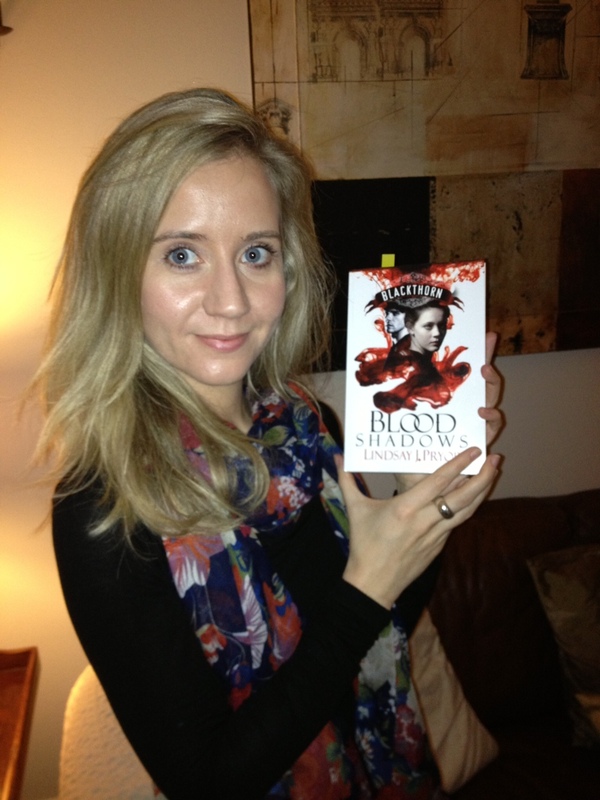 My hardcopy of Blood Shadows arrived last Friday and cannot tell you how excited I was to receive it. This series first found traction during the New Voices romance competition where for two successive years author Lindsay Pryor reached the final four. I believe her reader comments during the competitions numbered in the high hundreds. For a paranormal author this was an amazing breakthrough where hard-core romance readers crossed romance genres to fall in love with Kane. And that says a great deal about the quality of Lindsay Pryor’s writing. Since the fall of 2010, where I first read Lindsay’s work, I’ve followed her progress with huge interest. Lindsay had never let anyone, and I mean anyone, read her work before she entered the first competition. What she had been doing over fourteen years was to learn her craft and guys, she learned it well. Brought to you by Lindsay J. Pryor – powerful, absorbing, intense paranormal romance. Now as you can see Lindsay’s already found an impressive list of famous fans. I’m not famous but I know a literary diamond when I find one and Lindsay’s a shining, brilliant new talent in the paranormal genre. Her writing is fluid, lyrical with sensual descriptive prose which hits the spot. The dialogue between Kane and Caitlin sparks. One of the most challenging aspects of a paranormal author’s work is world building. And a dark dystopian world is a particularly tricky thing to pull off. Lindsay’s lived with her world, her characters, for many years which means she writes them with a confidence, an authority, that makes the reader believe they are real and the events which happen plausible and feasible. And that skill is what makes a talented writer a great one imho. And Blackthorn is a dark, claustrophobic, almost gothic world where nothing is as it seems. What struck me when I first read Lindsay’s work and especially after reading this book from cover to cover is the intelligent exploration and development of the love story. It’s hot, it’s passionate and it’s compelling, it’s even fiercely intense, but most of all Caitlin’s vulnerability and her courage in the face of that vulnerability – and how Kane copes with it – make this a fabulously valid emotional arc. I loved it. And there’s more to come, thank goodness. To say I’m utterly thrilled to be able to write this today is an understatement. My emotions are all over the place; pride, joy and a lovely tickle in the gut that I was RIGHT, lol! Oliver Rhodes of Bookouture (for authors click the link) has done a great thing by publishing Lindsay, a great thing, and he should take a bow while I give him a round of applause. Oliver’s had many years in publishing romance. The man knows his onions and he’s bridging a much needed gap between self publishing and publishing and given Lindsay the freedom to tell her story her way. A man of vision one might say and I for one wish him every success. So what’s next for Lindsay Pryor? Want to see what she looks like? Here she is. I think she looks cute but she tells me she was channeling her evil side. Nope. Book two, Blood Roses is out in the Spring of 2013 and Book three is out in the Fall of 2013. And she’d better be well on the way with books four, five and six or I’ll want to know why – no pressure! I’ll keep you all posted on Lindsay’s progress, but if she doesn’t end up with a film/tv deal tripping along the red carpet with the rich and famous then my crystal ball’s faulty. And as you all know, there’s nothing wrong with my crystal ball! I’ve missed you guys, but Rosie’s well, just being Rosie! Have you found a new writing talent? 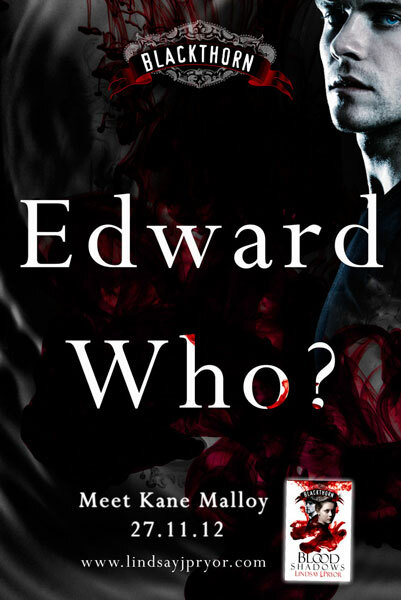 This entry was posted in Authors Name, BLOOD SHADOWS and tagged blogging, Blood Shadows, Bookouture, C C MacKenzie, Caitlin & Kane, fantasy, Kane, Lindsay Pryor, Oliver Rhodes, paranormal, Paranormal Series, vampire, writing process by CC MacKenzie. Bookmark the permalink. I wrote it in about fifteen minutes. After I’d read your book. It’s always a worry when a reader’s expectations are high as mine were. So I had to get into the right mindset to read it. And I’ll be totally honest with you, I wouldn’t have written this if I didn’t absolutely love it. I don’t write reviews (almost never on my blog) for a book unless it’s struck a deep chord with me because many readers trust me and I don’t ever want to lose that. I needn’t have worried. A star in born. And I’m utterly thrilled that you’ve pulled this off. You’d better be writing books four, five and six etc., and those shorts. Enjoy the moment. It’s a special one. And tomorrow its nose to grindstone because your readers will demand more, much more. Sounds great! Off to add it to my Christmas list! You won’t be sorry, Alica! OH BOY..More Good Reading to check out..next to Romance Books..Love a Great Paranormal One!! Hi Jane!!!! Lovely to see you here. Welcome! I think you’ll love it! I don’t usually read paranormal, but you did an awesome sales job, Christine. And I can’t resist that blurb. I have to read this so when the movie comes out, I can say , I read this when… 🙂 Thanks for the heads up on this new author! The cross over of readers to Lindsay’s work during the competition was amazing to watch in real time. I hope you enjoy it! And thank you for showing an interest, Sheila. 🙂 Hopefully you’ll enjoy it even if you don’t usually read paranormals. I get told a lot that it crosses the divide. We’ll see! When I read Lindsay’s first competition entry, Blood Roses, in 2010 I got goosebumps. I can count on one hand how often that’s happened. Then the reader feedback started rolling in and I knew my gut was right. She then worked her way through to get into the final four in 2010 and even then I was waiting for a publisher to grab her. Then in 2011 she entered again with the story of Kane and Caitlin and rose through to the final four. Again bringing new readers across into her genre. So I’ve been banging the drum for two years. Not publicly, but encouraging her confidence in her work since Lindsay works in seclusion and the results of that speaks volumes. I seriously think we can all learn something from that. And of course, we’ve had the publishing revolution in the meantime which means the big boys are not taking on an unknown without a track record. It’s interesting times. And you’re doing very well yourself, missus! Hitting the high spots! High praise indeed. That you wrote it in 15 minutes is testament to how great a writer she is and how much she inspired you. 🙂 I’ll add it to my to read list. Woo Hoo! Yes, it wasn’t hard. It wasn’t hard to write Dale’s either.